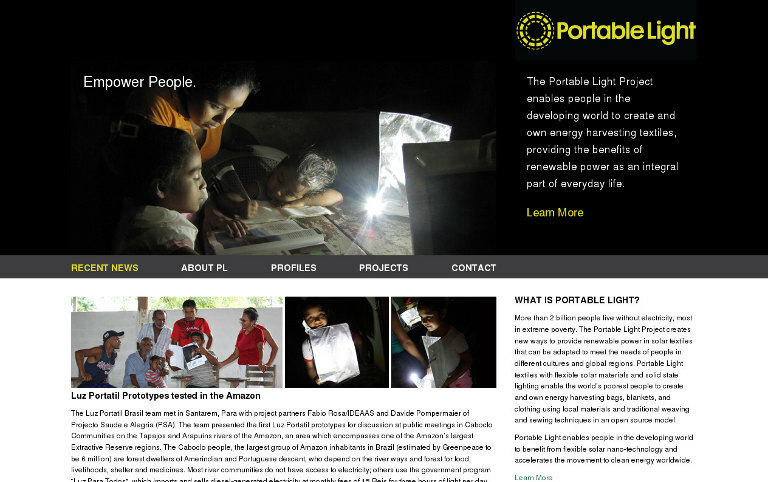 With 25% of the global population lacking electricity, the Portable Light Project has responded by rethinking traditional methods of delivering clean energy and light. The non-profit initiative led by MIT professor Sheila Kennedy provides adaptable solar textile kits that enable the world’s poorest people to sew and weave bags, clothing and blankets that harvest energy. Since developing its first prototype for Mexico’s Huichol Center in 2005, the organization has initiated projects in Brazil, South Africa and Nicaragua. In each case it has adapted Portable Light to meet the needs of the local population in line with a culturally integrated approach. This shape-shifting device has ranged from blankets for MDR-TB patients needing exposure to sunlight in South Africa, to FLAP bags for journalists in Kenya requiring light for travel and energy to charge cameras and cell phones. Regardless of its final form, the fast-charging and affordable flexible film is equipped with a reflector, USB port, LED light and rechargeable battery capable of charging a cell phone, medical devices, or radios. Working with an international team of community leaders, anthropologists, doctors, architects and engineers, the Portable Light Project is in the process of scaling-up production and distribution of its solar textile kits in order to catalyze new energy-generating communities across the globe.